This is for Lydia who confessed the other day that she suffers from a disease called 'Low-Lit'. It comes from the foreword of Nick Hornby's The Complete Polysyllabic Spree , a collection of his very enjoyable columns on books and readings for The Believer (the latest column is here). One of the problems, it seems to me, is that we've got it into our heads that books should be hard work, and that unless they're hard work, they're not doing us any good. ... If reading books is to survive as a leisure activity - and there are statistics which show that this is by no means assured - then we have to promote the joys of reading, rather than the (dubious) benefits. I would never attempt to dissuade anyone from reading a book. but please, if you're reading a book that's killing you, put it down and read something else, just as you would reach for the remote if you weren't enjoying a TV programme. Your failure to enjoy a highly rated novel doesn't mean you're dim. ... All I know is that you can get very little from a book that is making you weep with the effort of reading it. ... reading for enjoyment is what we all should be doing. I don't mean we should all be reading chick lit or thrillers (although if that's what you want to read, it's fine by me, because here's something no one will ever tell you: if you don't read the classics or the novel that won this year's Booker Prize, then nothing bad will happen to you; more importantly, nothing good will happen to you if you do); I simply mean that turning pages should not be like walking through thick mud. the whole purpose of books is that we read them, and ifyou find you can't, it might not be your inadequacy that's to blame. 'Good' books can be pretty awful sometimes. None finished this week. Book hopping. Am reading simulataneously Auster's New York Trilogy, Silverfish New Writing 6, Filipino writer Jessica Zafra's collection of short fiction Manananggal Terrorizes Manila (many thanks, Sky) and Ziauddin Sardar's Desperately Seeking Paradise: Journeys of a Sceptical Muslim (thanks Zia). So ... how about you? ... don’t even think in terms of knowledge-gained, increased-vocabulary or improved reading-skills. All that will come, I assure you, but don’t make it the reason you buy your kids books or encourage them to read. You don’t want your children to view books with apprehension, but with joy. You want them to see reading as an enjoyable activity. ... 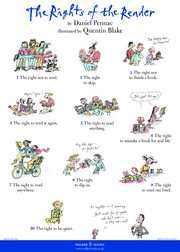 The list of rights says that the reader is the only one who has a say in what, where, when and how he reads. It says it’s OK to relax with a book; it’s OK to be lazy with a book; it’s OK to escape into a book; be loud with a book; and be silent with a book. It’s all good so long as you’re having a good time. cw posted an interesting response to this post. that little excerpt seems so familiar - i think i must have read that essay in the believer sometime back. it was about $12 canadian dollars per issue, and forking over that much for a magazine always made me slightly woozy and light-headed, especially since i would try to convert the amount to ringgit... but it's equivalent to the same light-headedness i feel when i walk into kinokuniya these days and pick up a copy of the new yorker and it's worth a week's worth of office lunches with some change to spare for a few LRT rides. but i digress. i've always enjoyed hornby's essays more than his fiction. how do you like the new york trilogy, sharon? i've always wanted to read it. city of glass was published as a stand-alone graphic novel, and it was really well-done - if only i can remember who did the illustrations. reading that made me want to read the trilogy. how strange that you say that 'city of glass' was published as a graphic novel! i was just reading it over coffee and the thought occurred to me that someone should make it into a graphic novel, it has that feel about it. it's a strange story ... very gothic and postmodern ... not what i expected at all. i feel the same way about 'the new yorker' i'd love to read it but my conscience won't let me buy it. i hadn't heard of 'the believer' until i picked up hornby's book. i have enjoyed a couple of his novels as light-reading 'about a boy' and i can't for the moment remember the name of the other one. Thanks, Sharon! Amen to Nick Hornby for writing that. The diagnosis came at a time I was reading On Beauty and The Blind Assassin at the same time. Too much of a good thing at one go. But now I'm enjoying Assassin more than Beauty and can't wait to finish it. Daphne Lee wrote a book review in yesterday's Sunday Star that it's okay to start a book and stop if you feel like you can't get through it. My teenage daughter is reading The God of Small Things. She said it's boring and has stopped somewhere at the beginning. I told her to skim through the boring bits and that the exciting part will come soon enough. Sounds like what Xeus had been telling me about The Blind Assassin, haha. Oh, so can I put down the Inheritance of Loss then? Except that I have to read it for the book club ... sigh. Latest buy and now reading Michael Faber's One Hundred and Ninety Nine Steps. Also bought Shalimar The Clown and Inheritance. God knows when I'll read Shalimar but I wanted to exercise the right to buy a restricted book. 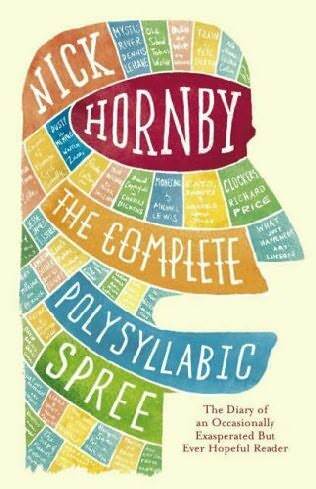 Love reading Hornby - always a pleasure, never a chore. ah yes, the piece by daphne - should have linked it - there were so many good things in the star yesterday! Oh I feel so liberated after reading this. Often, I force myself to push through a book to finish it off. I am still on Desai's book and reading name of the rose by Umberto Eco as well. sharon how do i get in touch with adibah amin? ms d - i will find it for you. keep bugging me until you hear back from me. Well, somehow I am intrigued by Umberto Eco's storyline. And as I mentioned as some point earlier - I have been reading books based in India - Kasmir, Punjab consecutively and hence Inheritance of Loss is suffering from the overload. Sham- I like Umberto Eco's storylines too. I find Baudolino and The Mysterious Flame of Queen Loana interesting and I enjoyed How to Travel with a Salmon and Other Essays which is non-fiction. But his best book is still The Name of the Rose. Like Sharon, I love the movie with Sean Connery and the ugliest cast of men I have ever seen in a movie. funnily enough, i had to abandon the name of the rose midway through the book - and that is something that haunts me still. haha.. it seemed to be the kind of book i ordinarily would have loved - but i suppose i couldn't get into the mood and feel of it at the time. i should attempt it again at some point. Nothing good will happen to you if you read the novel that won this year's Booker Prize? Well, perhaps you won't instantly become sexually attractive to everyone of your chosen gender but if you choose Ice Station over The Inheritance of Loss then I'd suggest you might just as well have sat in front of the TV and watched a rerun of The Ozbournes or perhaps that is unfair on Ozzy. There is the possibility that giving kids books which are beyond them will cause them to hate reading, but I'd say that there is also the possibility that if you give them books which don't offer a challenge then they'll turn into braindead pop-culture drones happily singing along to the latest McDonalds jingle. And for adults, well there's no one to blame but ourselves if we decide to accept the lowest common denominator as our personal benchmark. adhd librarian - agree with you. best is to provide kids with plenty of choice so that they can pick the stuff they enjoy. enjoyed your blog btw. if i have the opportunity again i'll send you more. i fully agree with Daphne's view, and the rights of the reader! have always thought the way we were "forced" to read back in primary in school, and then to write a brief / review about it, as the ultimate way to kill a child's interest in reading. sky - i will catch up with you bookwise and soon, promise. Yes, the RIGHTS of a READER; and not the rights of a WRITER. Readers will pick and choose the books THEY want and like to read. If writers do not write the books which will attract readers, then their books will not sell1 In fcat, their manuscripts may not even be accepted by publishers. After all, there is no free lunch for writers! So many REJECTIONS by publishers of manuscripts show up clearly WHY they are rejected! They are just attractive enough for readers. So, why waste time and cost in printing them in the first place ? Hence books should be readable; and place READERS first, not writers. Otherwise, writers will only read their own manuscripts! They will be gathering dust and remain UNPUBLISHED!They are rejects.